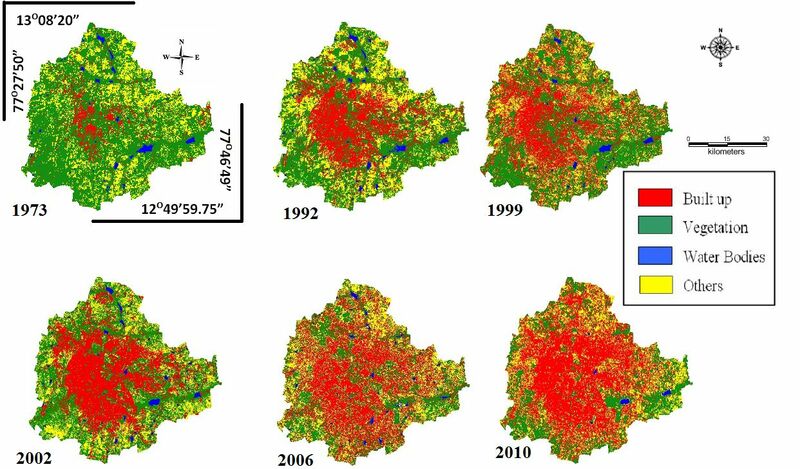 New research shows the dark side of the IT Boom, how lakes and trees have disappeared and how IT boom made Bangalore unlivable. A recent study by T V Ramachandra of the Centre for Ecological Sciences titled Insights to Urban Dynamics through Landscape Spatial Pattern Analysis says urbanization has reduced vegetation and water resources so much it threatens habitation in the city. It shows 525% growth in built-up area in the last four decades since the IT boom, 78% decline in vegetation, 79% decline in water bodies. These are not just figures, but the lakes and trees that surrounded you have quietly disappeared as a result of the urban sprawl. The Below figure illustrates there has been a 584% growth in built-up area during the last four decades with the decline of vegetation by 66% and water bodies by 74%. Analyses of the temporal data reveals an increase in urban built up area of 342.83% (during 1973 to 1992), 129.56% (during 1992 to 1999), 106.7% (1999 to 2002), 114.51% (2002 to 2006) and 126.19% from 2006 to 2010. 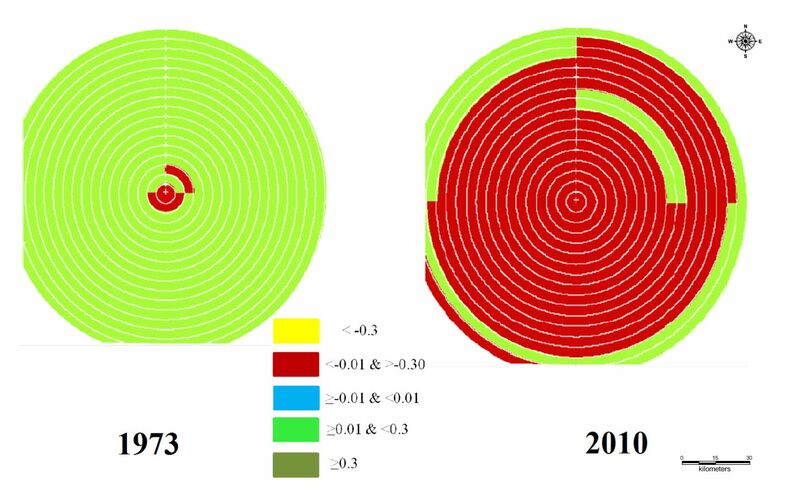 The urban density gradient given in the below Figure for the period 1973 to 2010, illustrates radial pattern of urbanization and concentrated closer to the central business district and the growth was minimal in 1973. Bangalore grew intensely in the NW and SW zones in 1992 due to the policy of industrialization consequent to the globalization. The industrial layouts came up in NW and housing colonies in SW and urban sprawl was noticed in others parts of the Bangalore. This phenomenon intensified due to impetus to IT and BT sectors in SE and NE during post 2000. Subsequent to this, relaxation of FAR (Floor area ratio) in mid-2005, lead to the spurt in residential sectors, paved way for large scale conversion of land leading to intense urbanisation in many localities. This also led to the compact growth at central core areas of Bangalore and sprawl at outskirts which are deprived of basic amenities. 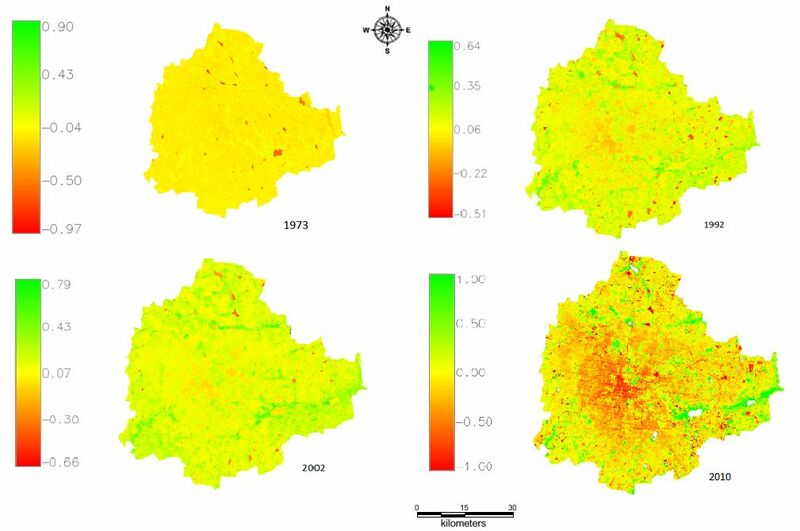 The analysis showed that Bangalore grew radially from 1973 to 2010 indicating that the urbanisation has intensified from the city centre and reached the periphery of Greater Bangalore. The development during 1992 to 2002 was phenomenal in NW, SW due to Industrial development (Rajajinagar Industrial estate, Peenya industrial estate etc.) and consequent spurt in housing colonies in the nearby localities. The urban growth picked up in NE and SE (Whitefield, Electronic city etc.) during post 2000 due to State’s encouraging policy to information technology and biotechnology sectors and also setting up International airport. Similarly, a study conducted last year by V Balasubramanian, former additional chief secretary of Karnataka warned that in recent future Bangalore may have to be evacuated due to water crisis. He sounded a warning bell for Bengaluru: If the current rate of groundwater utilisation continues, there will be a major crisis by 2025 when people may have to be evacuated. What’s the point earning better when the food that you eat is adulterated? As a result of unplanned urbanisation, Bengaluru is going to be an unliveable and dead city in the next five years, Ramachandra told Deccan Herald. “It’s disturbing to see private developers dominate government decisions. The norm to keep at least 15-20 % of the city as open space is ignored, stormwater drains and water bodies have been narrowed. At least now, the government should wake up and get is priorities right to make Bengaluru a sustainable city,” he said. It is not just natural environment that this unplanned and unregulated development has drastically affected. According to the National Crime Records Bureau, at least 35 in every 100,000 people in Bangalore commit suicide. As reported by Rediff, Bangalore now has become India’s suicide capital. The National Institute of Mental Health and Neurosciences in Bangalore also treats patients for stress-related ailments. Doctors at NIMHANS say software engineers in the age group of 24 to 30 years form a large chunk of the patients facing this problem. The doctors add that such patients complain of restlessness, lack of concentration, anxiety and body pain — all of which are symptomatic of stress. In the last two months, over 100 IT professionals have made a beeline to Ayurvedic centres for de-stressing programmes, where they are taught how to strike a balance between their personal and professional lives. The common factor, the doctors add, is that most of these youngsters are stressed out about money. Since the IT boom took place, salaries are at an unbelievable high. This has prompted banks to make tempting loan offers. At least five out of 10 IT workers fall into the trap. Over past 20 years since liberalization and the IT boom we have opened hundreds of engineering colleges turning out lakhs of engineering graduates in very narrow fields of disciplines (to be specific in the fields of IT, Computer Applications etc) deceiving ourselves into believing that the entire population of over a billion people can become gainfully employed by merely cashing in on the IT boom. In the process we showed neglect to all other traditional disciplines of education that stood as backbone of our country’s development. On one hand employment in regular traditional engineering courses (civil, mechanical, electrical, automotive) dwindled or remained stable. But in the neo-engineering courses that came over the last 10 years since the IT boom (IT and Computer Applications) employment stagnated and became negative. While, on the other hand, in many other fields where there is a strong potential future for healthy and balanced employment not even the foundation courses are currently being offered. A gradual but sure neglect set into the education scenario over 20 years with disastrous consequences since the narrow parochial system encouraged only 5 to 10 computer or IT boom related courses in India. Indians became largest computer application users. The possibility of research and development in many areas from space to agriculture development over a carefully thought 25 year self-reliance policy gradually started to decline. Key board users increased in number than key user fields in respective science technology and economic segments. A new era of qualified Human Resource dependency in all other fields started to dawn in. The applications of computers in many other fields like natural resource development, utilization of such resources for overall regional balanced growth, utilizing the enormous data processing capabilities of computer for handling routine tasks in agriculture, and many such developments never occurred in India. However similar trends could be noticed in other sectors and states as well as we have reported earlier. Nearly 60% or 160 out of the overall 255 malls currently operational in top seven Indian cities are facing an uncertain future as customers have deserted them for various reasons. At the same time if you happen to travel through the suburbs of the Indian capital, Delhi, you will see miles and miles of built homes with nobody living in them. Even as the country faces a shortage of 19 million houses, around 10.2 million completed units are lying vacant. One such case is that of the tribal Chenchus who are being driven away from their ancestral homeland in the Nallamala forests under various government schemes like Project Tiger, threatened with revolvers under the suspicion of being Naxals, for the mining projects awarded to De Beers. What De Beers is hunting is the ancient wealth of Vijayanagara Empire secretly hidden in these forests and protected by these Chenchus for centuries; the same wealth that the East India Company was after but couldn’t get it’s hand on because of the brilliant strategy of Commander-In-Chief Tirumalaya Raya. Various courts in India including the Supreme Court are either silent on this human tragedy of forcible displacement or in rarest cases sided with the government and big MNCs in pursuing their agendas. In many cases even if there were no environmental clearances for such huge ecology damaging projects like Tehri Dam or Tata and POSOCO or Vedanta, DeBeers still they went ahead grabbing the lands of poor and destroying the ecology for MNC interests. 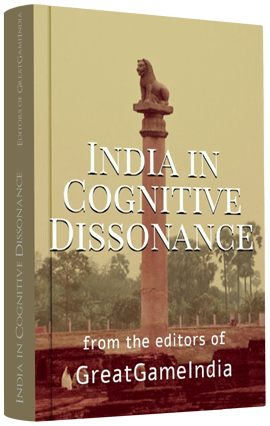 It wouldn’t be far-fetched to say that in the name of development India is now run only for the profit maximization of giant western Multinational Corporations (MNCs) which are in their latest avatar from the erstwhile East India Companies (EICs). In fact all the owners of current MNCs are the grand children of the previous East India Companies, in lineage, spirit, methods, tactics and business policies (read Business Intelligence). For a detailed study of the origin of these EICs, their motives and the motives of MNCs along with the commodities EICs dealt with and MNCs plan to deal with or are already dealing with; along with the elusive owners of these MNCs tracking them back to their East India Company roots kindly refer to our East India Company Series.